The Turkey Made Me Do It!!! Since I did SOOO good by not going to any of the after Thanksgiving Sales, buying things that I didn't need or really want but couldn't pass up because they were priced so good, and since I didn't have my names to buy for this year just yet ......and potentially saving myself untold amounts of money....I decided to award myself by going to the local yarn store! I have never knit with these yarns and I am looking forward to giving them a try! 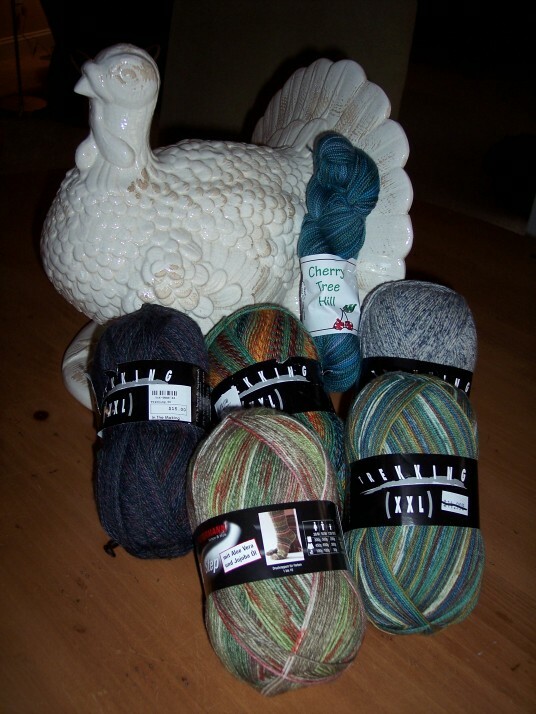 The Cherry Tree Hill was some yarn that I had ordered and just received. I still have 2 pairs of socks to finish using some cheaper sock yarn and then I am going to make a pair from the yarn that Tonni gave me.....THEN I can start on these!!! Ahhh...the anticipation!! Swatch is now completed.....unfortunately as I am such a tight knitter I can't count the stitches to check my gauge.......will have to purchase a magnifying glass in an attempt to count the little buggers!! Thanksgiving Reflections: I'm not sure the history behind my Grandmother's pumpkin pie but for some reason she wasn't fond of traditional pumpkin pie so she created her own recipe....not spicy at all, a custard type consistency and a staple at all our Thanksgiving meals for as long as I can remember. 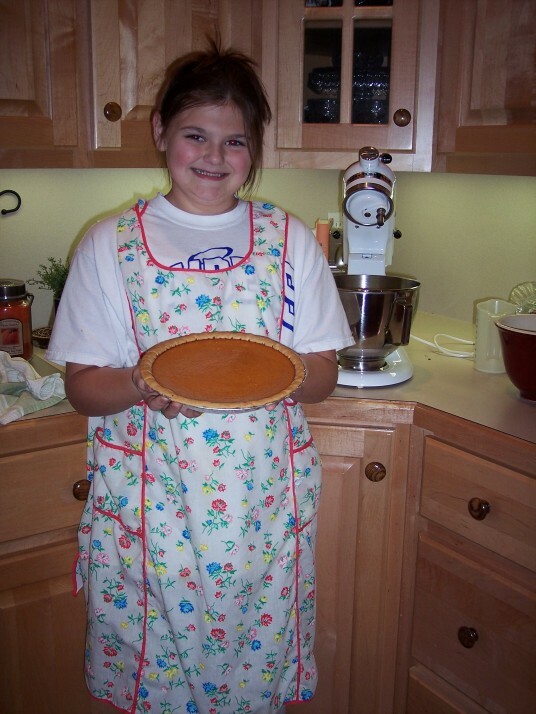 Many years ago when my Grandmother was no longer able to make the pies she passed on her recipe to me and for years I was the purveyor of the pumpkin pies. Three years ago, I invited Princess Cupcake to learn to make the pies and we now have the tradition of making pies the night before Thanksgiving......usually 6. Here is a picture of Princess Cupcake wearing her Great-Great-Grandmother's apron and showing off her first pie out of the oven. 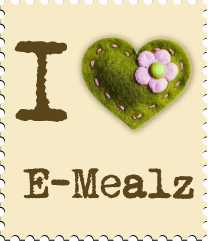 I hope everyone has a wonderful day today filled with lot's of good food, family, friends and perhaps a bit of knitting!! My blessings this year are too numerous to count!!! 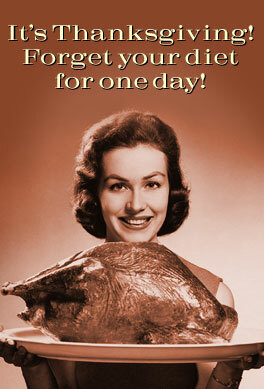 I am most grateful for being healthy ( you know when you are pushing 50 you start thinking about such things!LOL!) and that I have my family in addition to a wonderful circle of friends! I am still working from home which is just too good to be true and I can't believe how fortunate I am to still be pulling this off after 4 years!! I have the most wonderful husband in the world....and he is my best friend!!! Blessings to everyone this Thanksgiving Day!!!!!!!! I would like to go on record right now.......I do NOT like to swatch!!! I do not like to swatch at night, I do not like to swatch in the morning, I do NOT like to swatch AT ALL!! !!! How BORING can you get????? Not to mention my swatch is a slap in my face that I knit different gauge at different times of the day (aka stress level). I already KNEW (thank you very much) that I don't knit consistently!! NOW I have this, this, spitefull little block of yarn that just GLARES at me with it's different gauge!!!! Mocking me!!! Now before you get worried that I have anger "issues".....let me just say here.......I think anger when applied correctly is a GOOD thing.....remember how mad I was at my first sock attempt? It was my anger at not letting that stupid ball of string and a handful of sticks get the best of me....and see where it got me? I am now a sock knitter.......improving with each pair!! I got really angry when a friend was robbed while shopping at a local store and the management did nothing to insure the safety of future shoppers.....so I rallied up a group, we complained to the home office and the store was forced to hire a security guard or risk losing business......I believe the owners of the Food World chain of grocery stores received around 100 phone calls that day!!! When applied correctly anger can be a great motivator for good!! (stepping off my soapbox now). I guess what I am saying is that I will embrace my swatch anger and put it to good use......right after I put band-aids on my sore finger tips......Love those Knit Pick needles but MAN are those points sharp for this tight, tight knitter!!!! Update later on the swatch/sweater!! Why YES......it IS a Sweater!!! 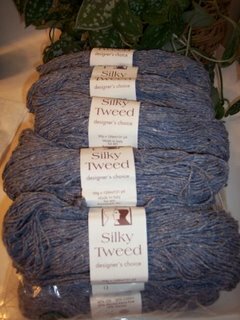 Can't you just SEE the gorgeous sweater this yummy periwinkle/denim blue silk tweed yarn will make?? Everyone will be SOOOO impressed!! I can just hear it now....oh Darlene....it is the most beautiful sweater in the WORLD.....where can I buy one? WHAT? You say you MADE this beautiful sweater??? You mean it is a one of a kind, original, knitted by you sweater????? M.U.S.T. have one of these most perfect sweaters......I'll pay....BIG bucks, maybe even clean your house for a year!! Ahhh, it is such a happy little place in my head!! LOL!!! Fact is......I am already nervous about this sweater project. I like the short n sweet, immediate gratification projects. (Hmmm....wonder what this says about me?). Remember my vest I posted about......oh..... several months ago? The one that I have never finished because it requires too much thinking and that I have put aside for "one of these days".......like in case of emergency and I can't get out to buy yarn for any other projects and I am FORCED to finish the vest or have nothing to knit at all??? Yep.....I have obligated myself to a sweater....with sleeves.....have I lost COMPLETE control of my mind???? Tonni showed me a sweater she made the last time I visited with her and it was SOOOO pretty, I was caught up in the moment when she told me how easy it was to make and that we should make one......that's all it took!! LOL!! Tonni even found the yarn......on CLOSE out pricing....it was fate!!! She also has a sweater wizard program and created a pattern for me based on my measurements......(which we will NOT discuss)! Now the pressure is on! The sweater will be a "simple" (reserving judgment on this term for later) knit pattern, raglan sleeves, K2,P2 ribbing at the sleaves and waistband. Sounds simple, but I have this little problem with gauge. You would think after knitting for 2 years I would be able to knit consistently......so......we'll see how this sweater project turns out......but it will be fun and good experience!! I'll keep you posted!!! Keep your fingers crossed for me!!! LOL!!! 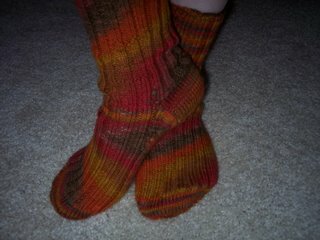 I believe this is the last picture I posted of my Octoberfest socks!! TA DA!!!! I present my Latetoberfest Socks!!! (Previously named Socktoberfest Socks but since it is almost Thanksgiving I have renamed them)! LOL!! I actually finished these socks last weekend but just now getting around to getting them posted. 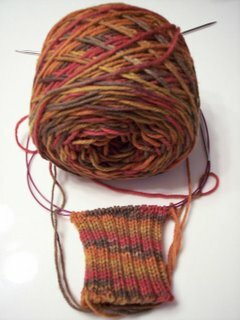 I have a mental block about doing a swatch and these socks ended up sort of loose. Last night at Chicks with Sticks I ripped out a sock that was too tight......so I'm just thinking here that there is a REASON why labels list the gauge! LOL!! I don't know WHY I have such an aversion to knitting a swatch!! Does everyone knit a swatch? 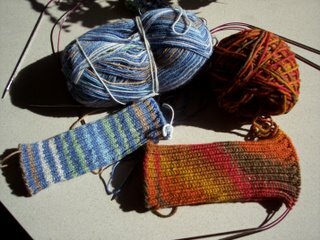 Maybe I just haven't made enough pairs of socks to "know" what size needle to use to get the result I want. I have some GORGEOUS yarn I received as a gift from Tonni that I am DYING to get started on but I think I'll make one more pair.....I still end up having to darn certain spots on my socks before I can wear them and I would like to be able to knit a PERFECT pair of socks with it! Knit on size 3 Knitpicks Circular needles. 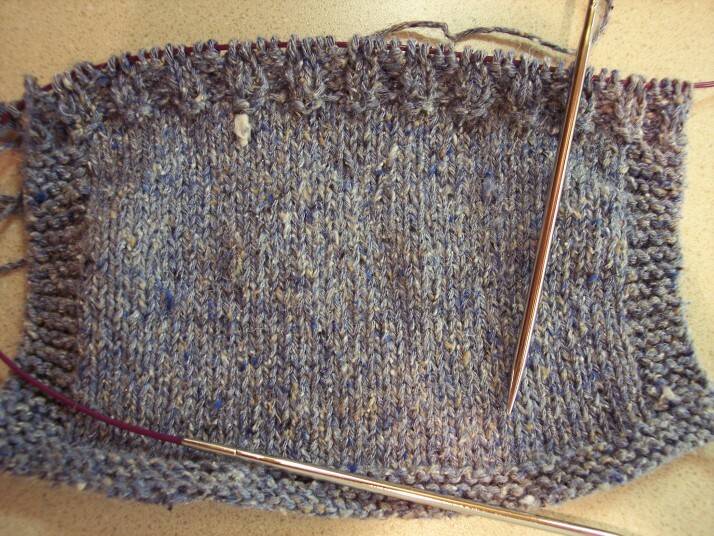 WELL......pull up a chair and I'll tell you a little story of how NOT to knit a sock heel!! So, I'm happily knitting away on my second Socktoberfest sock....(which I am now calling the Latetoberfest sock).....anyway.......you know on that simple pattern when you get to the point where you have just turned the heel and it says: Knit across the heel stitches and pick up the side stitches??? Guess what happens when you DON'T knit across that turned heel before you start picking up stitches....ahhh.....you real sock knitters already know I bet......you end up knitting INSIDE OUT!! Yessiree....that is EXACTLY what happens when you leave out that tiny little step of knitting across the heel!! And I would imagine that MOST folks would pick right up on that fact....but ME???? Oh NOOOOO.....took me 2, thats TWO times before it dawned on me!!!! I am going to blame it on the lateness of the hour factoring in extreme fatigue and hopefully not that I am a complete IDIOT!!! SO.........while I get my Latetoberfest sock back on track tonight I bring this view from my yard! 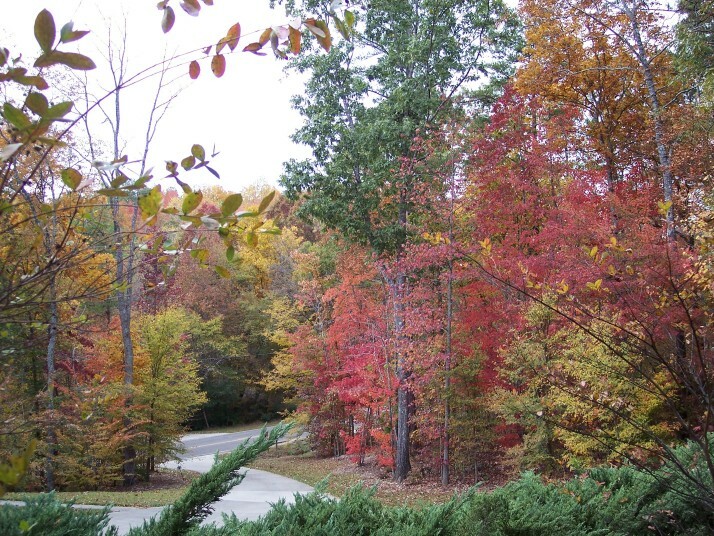 I read somewhere that Fall is God's Greeting Card.....WOW!!! After working at "warp speed" all week and despite being tired we got up at 5:30 Saturday morning, drove to Auburn to spend the day with some friends of ours. We arrived to THIS!! 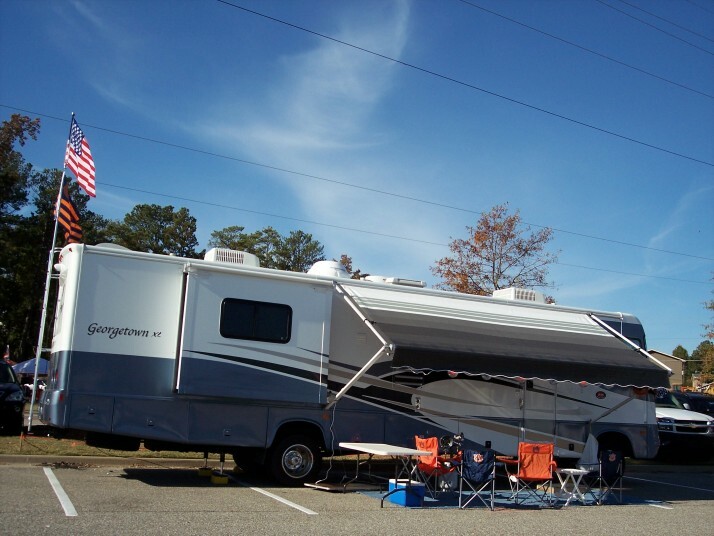 Talk about a TAILGATE PARTY PALACE!! This thing is N.I.C.E!!!! It has 1.5 baths!!! Three televisions! One large screen T.V. is on the outside (pic taken before full party set up)....AWESOME!! It was cold but they had an outdoor heater that kept us toasty warm the entire time! The guys went to the game while Kay and I spent the afternoon knitting! I managed to get two socks completed down to the heel flap but I left my pattern at home so I had to put that par t on hold till one evening this week. We had way too much good food, good fun and the day absolutely FLEW by!! 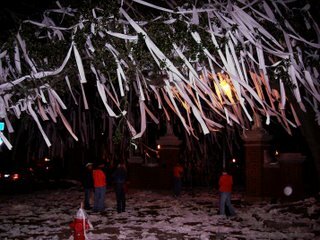 Before we knew it we were on our way home.....first we had to drive by Toomers Corner. YEP....they still roll it!!! The last Auburn game we attended was when my sister was a Senior at Auburn.....WAAYYYYYY back in 1987!!!! No that's not a typo....it was 1987! We had so much fun we plan on going to as many games as we can next year! !